ARE YOU READY TO TAKE ACTION, AND MAKE A DIFFERENCE? Far-sighted founding members created WWTA in response to decreasing public access to shoreline on Washington State’s Puget Sound in the late 1980’s. Since then, larger parcels of undeveloped shore lands have been increasingly sub-divided, vastly limiting shore lands available for paddlers to launch and land legally and safely. Current estimates of shore lands available for public access to waterways range as low as 10 to 20 percent, depending upon the area in the state. 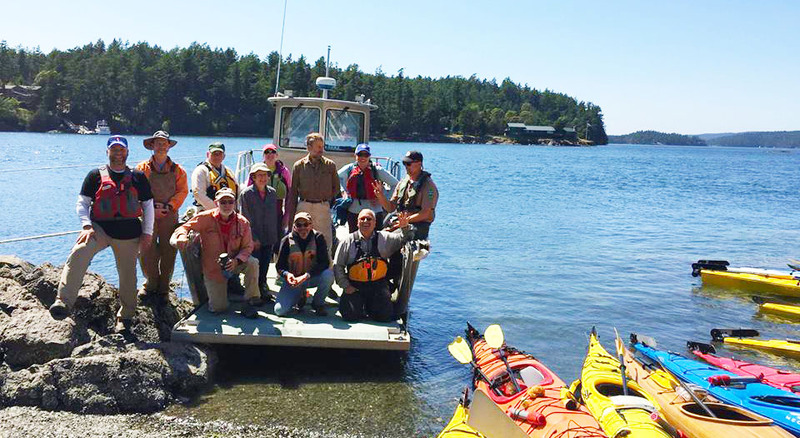 More than 80 site stewards have been trained over several years, and annual work parties occur on several Cascadia Marine Trail sites, with additional work parties determined through site steward reports. If you are ready to make a difference, you can champion stewardship of the Cascadia Marine Trail by becoming a friend and advocate for Washington Water Trails Association. You can become involved with WWTA in many ways. Volunteers make WWTA’s work possible! Our dedicated members and friends help maintain and steward water trail sites through work as site stewards and work parties, assist with outreach at events, offer support in the office, and more. If you have an idea about how you can help, please let us know. Contact us at wwta@wwta.org or call the office (206.545.9161) to take action. I am member who has a home not far from the site on South Whidbey island at Possession. I am willing to work on the site a couple of times a year. I have enjoyed and continue to enjoy WWTA sites and would like to give back. I think this site is one where I can do so with my work schedule etc. Please let me know what I can do to help. I have time this winter over the holiday break for example and could do some maintenance on the signs for example. They are getting pretty well oxidized and should be replaced with new ones under the plastic. We would love to have you help out with this site! Please feel free to contact the office if you need support – we have a board member who lives on Whidbey, and another who visits often.